The chronological resume is the most common resume format that job seekers use. Read on to find out if it’s the right choice for you. Chronological resumes are the gold standard resume format. Yet while they remain the most popular way to structure a resume today, it doesn’t mean they’re necessarily the best choice for you. Read on to find out if you should use one to land your dream job. 1. What is a Chronological Resume? A chronological resume (sometimes called a reverse-chronological resume) is the most commonly used resume format among job seekers. This style is what most people think of when they hear the word “resume.” It gets its name from the fact that the job seeker lists lists their past jobs in reverse-chronological order in the work experience section. Most HR departments favor chronological resumes. Job seekers prefer this format because it accommodates all industries and levels of experience; HR departments prefer it because it is so conventional. Since work experience is listed chronologically, this format is fantastic for those who want to demonstrate a vertical career progression. The only reasons why this format might not work for you is if you have work history gaps or frequently change jobs. In these cases, you might want to consider a skills-based functional format resume or alternatively, the hybrid combination format. Outside of these situations, the chronological format is often a safe bet for job seekers. 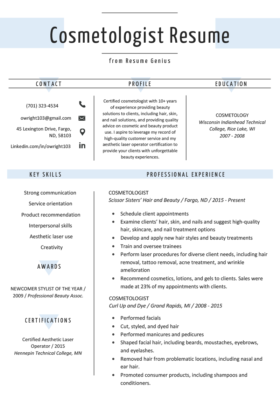 Contact Info – Vital information, so it goes in a prominent place at the top of your resume. Career Objective – A career objective is a resume intro that outlines your experiences and skills. Work Experience – Here, summarize your present and past jobs in a reverse-chronological order. Key Skills – The purpose of the key skills section is to show off your attributes and skills. Remember to include a mix of hard and soft skills. Education – List your degree, where it was obtained, and your GPA. Other certifications can be added too. Awards – Whether it’s employee of the week or something from college, note it here! Generally, chronological resumes are ordered in a tried-and-tested way. You’ll want to stick to the following order when writing your resume. 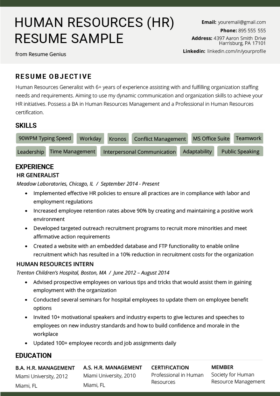 When it comes to writing a resume, this section is as straightforward as it gets. Here are the essentials: name, address, email address, and phone number. If you want to go above and beyond, then add a link to your personal website (but only if it’s professional!) or your LinkedIn profile. When writing your address on your resume, you should keep security and privacy concerns in mind. 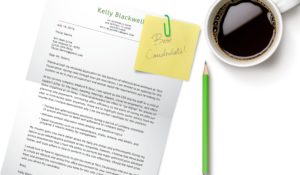 The chronological resume format allows you to choose between three resume introductions: the more traditional career objective, flexible professional profile, and bullet-point qualifications summary. Each type of introduction has its own advantages and disadvantages based on the type of job seeker you are. For instance, a qualifications summary is great for applicants with a wealth of skills and abilities, which means it’s helpful for experienced candidates but not ideal for recent college grads. To find out which resume introduction is best for you, simply use our resume introduction flowchart! The professional experience section is the meat and potatoes of chronological format resumes. Numbers help to illustrate your accomplishments. The goal here is not to provide a list of tasks you performed at your past jobs but rather to showcase your achievements and how you excelled in previous roles. The best way to do that is to add measurable figures to your bullet points. Numbers illustrate your accomplishments and provide the employer with a better understanding of your abilities. Another way to make this section more effective is to start each bullet point with an action verb. Action verbs target your bullet points, making it clear to the HR manager exactly how you achieved your goal. Find great examples of action verbs by using the longest list of action verbs in the universe. Unless you are a student or a recent graduate, your education section does not have to be too detailed. Providing the name and location of your university, type of degree, when you graduated, and your GPA (if 3.0 or above) is usually enough. However, if you are still in school or have just graduated, your education section will be a bit different. For example, educational experience should be listed before professional experience on a student resume. For more great tips on writing this section, just refer to our education section writing guide. Including an additional skills section on your resume allows you to add any extra skills that you did not have an opportunity to add elsewhere. But remember, make sure the skills you add apply to the position you’re applying for—by using our guide to writing the skills section of your resume to properly convey your skills, you will land you more jobs. 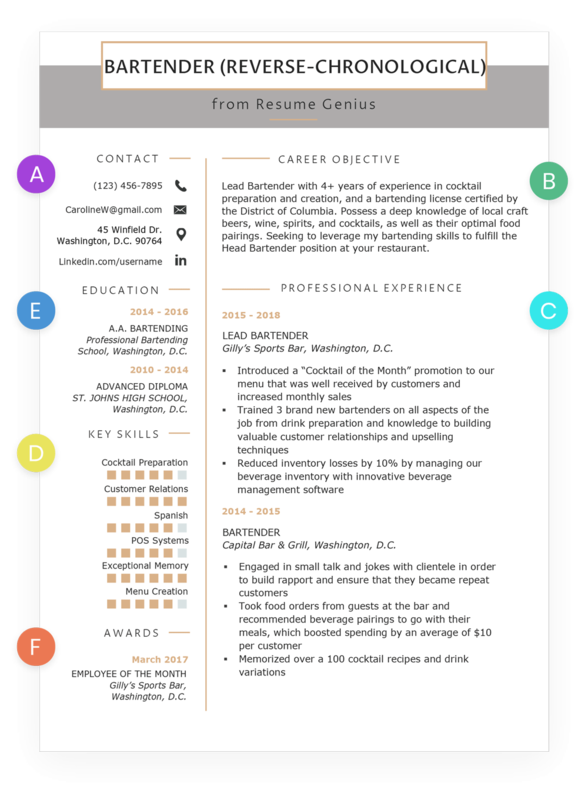 We’ve gathered some of the best examples of chronological format resumes. Simply click the images below to see a larger version. Open these text versions, and then copy and paste them into your word processor. Waitress with 5+ years of experience in providing excellent service to diners at quality establishments. Possesses familiarity with POS terminals and common restaurant machinery. Expert with a proven ability to “upsell” alcohol, dessert, and appetizers to customers. 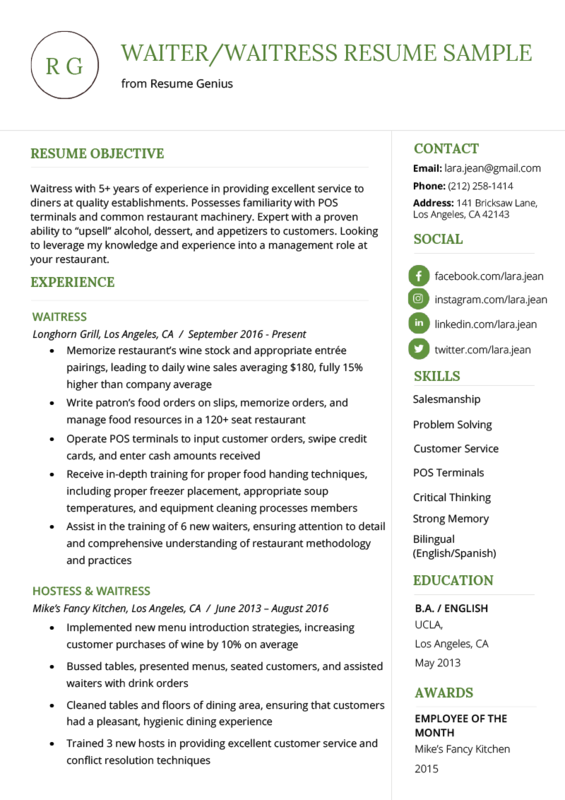 Looking to leverage my knowledge and experience into a waitressing role at your restaurant. Line Cook with 5 years of experience in Cajun, Creole, and Middle Eastern Cuisines. Possess expertise in creating sauces and cooking seafood and poultry, as well as following recipes and presentation with meticulous detail. Demonstrated skills in improving cooking processes and reducing food waste and costs. Recipient of awards, commendations, and numerous positive feedback from patrons. Food Service Worker with 6+ years of experience serving and preparing food in a variety of different food establishments. Provides excellent customer service, and possesses encyclopedic knowledge of wines, entrees, restaurant equipment, and POS terminals. 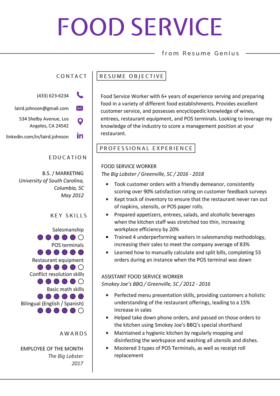 Looking to leverage my knowledge of the industry for a host role at your restaurant. Kept track of inventory to ensure that the restaurant never ran out of napkins, utensils, or POS paper rolls. Maintained a hygienic kitchen by regularly mopping and disinfecting the workspace and washing all utensils and dishes. Click on the buttons below to get the text versions, and then copy and paste them into a word processor to edit them. Flight Attendant with 6 years of experience in domestic and international charter and commercial flights. Demonstrated exceptional customer service, receiving positive feedback from passengers and commendations from crew. Proficient in emergency situations, fully trained in CPR and AED, as well as diffusing situations from reaching dangerous levels. Housekeeper seeking to utilize proven professional skills and hotel management knowledge to fill a full-time housekeeping role in your hotel. Possess excellent time management and efficient cleaning skills, always aiming to achieve and maintain elegance while adhering to a strong ethical foundation. Junior Housekeeper self-motivated to make our hotel a second home for all customers served. Awarded “Top 5 Employees of the Year” in 2012. Assistant Housekeeper performing general cleaning assignments and services in hotel rooms, hallways and common areas. Certified cosmetologist with 10+ years of experience delivering beauty solutions to clients, including hair, skin, and nail solutions, and providing quality advice on cosmetic and beauty product use. I aspire to leverage my record of high-quality customer service and my aesthetic laser operator certification to provide your clients with unforgettable beauty experiences. Click below to access the text versions, and copy and paste them into a word processor to edit them. 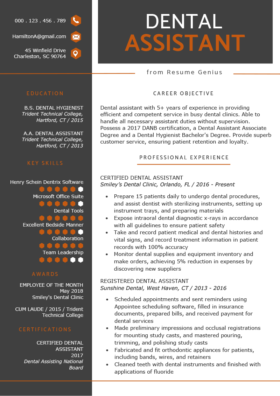 Dental Assistant with 4+ years of experience providing efficient and competent service in busy dental clinics. Able to handle all necessary assistant duties without supervision. Possess a 2015 DANB certification and a Dental Assistant Associate Degree. Provide superb customer service, ensuring patient retention and loyalty. 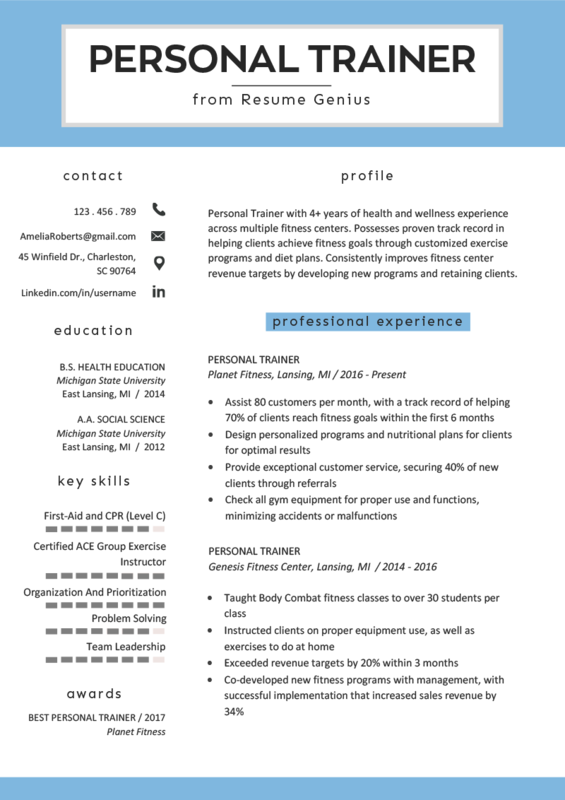 Personal Trainer with 9 years of health and wellness experience across fitness centers. Possess proven track record in helping clients achieve fitness goals through customized exercises programs and diet plans. Consistently improve fitness center revenue targets by developing new programs and retaining clients. After you copy and paste the text versions below, modify the text to incorporate your own details. Recent graduate in paralegal studies with experience conducting interviews and legal research. 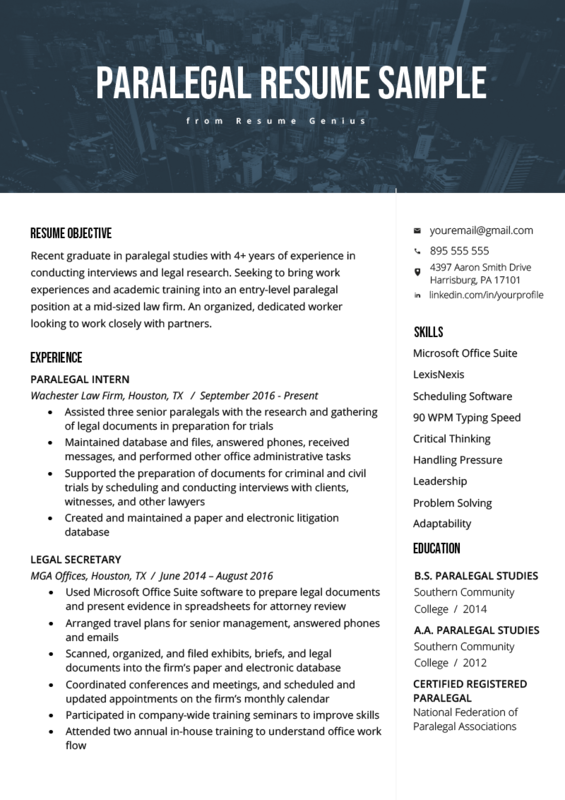 Seeking to bring work experiences and academic training into an entry-level paralegal position at a mid-sized law firm. An organized, dedicated worker looking to work closely with attorneys. Type correspondence, reports, text and other written material from rough drafts. Check source documents for accuracy, verifying when necessary. Follow all internal security procedures to assure accordance with HIPPA. Maintain ongoing accounts of over 1000 patients. Compiled, prioritized, and sorted, and processed customer orders into local database. Adjusted settings for format, page layout, line spacing, and other style requirements. Transmitted work electronically to other locations upon request. Researched further information for incomplete documents. Maintained a hard copy backup of all sensitive information. Performed other clerical duties such as answering telephone, sorting and distributing mail, running errands or sending faxes. Hi, I quit my job to hike from Georgia to New Hampshire along the Appalachian Trail. 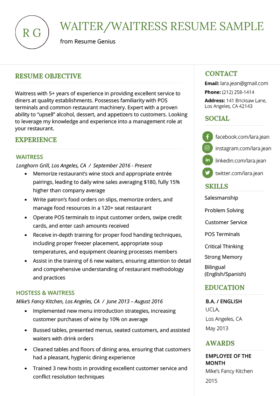 I’m currently looking for a new job, and my hiking experience is not relevant to my field, but I was wondering if I should put it on my resume anyway, as it might help me stand out. Simply replace the information in the template with your own and you’ll have a great looking resume that’s perfect for a civil engineer. Good luck! It is indeed true that you should not include a photograph on your resume. You want the hiring manager to judge you based on the merits displayed in your resume, not because of the way you look.